When the Sumerian king Gilgamesh refused to fall in love with the goddess Ishtar, he gave her a lot of reasons why not, and he was pretty nasty about it. One of the reasons Gilgamesh gave Ishtar was that she treated all her lovers badly. For example, once she fell in love with her shepherd. The shepherd made fires for Ishtar and cooked lambs for her (as sacrifices to the goddess). Yes, that’s the end of the story. Soon Ishtar began to hate the shepherd and turned him into a wolf. His own herd-boys hunted him down, and his own dogs tore him apart. Gilgamesh the King, The Revenge of Ishtar, and The Last Quest of Gilgamesh by Ludmilla Zeman (1998-9). This is a set of three kids’ books that retell the story of the Epic of Gilgamesh in an age-appropriate way. Lovely pictures. The Epic of Gilgamesh: An English Version With an Introduction (Penguin Classics), by N.K. Sandars (1972). A translation of the actual text of the epic, for older students. The long introduction explains a lot of the ideas and context. Not the most accurate translation, but a good readable one. Or check out the article on the Epic of Gilgamesh in the Encyclopedia Britannica. Cite this page: Carr, K.E. 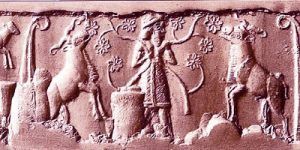 Shepherd story – Epic of Gilgamesh – Mesopotamia. Quatr.us Study Guides, September 15, 2017. Web. April 18, 2019.